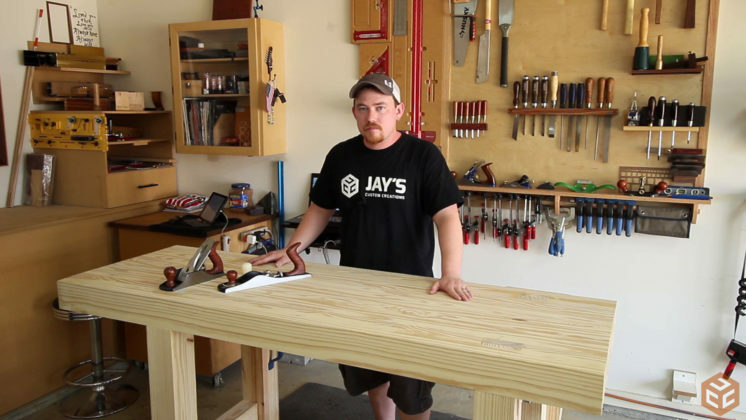 When I made my workbench in the beginning of this year I didn’t immediately flatten the top. It was pretty close to being flat already and I thought it would move a bit in the first few months. 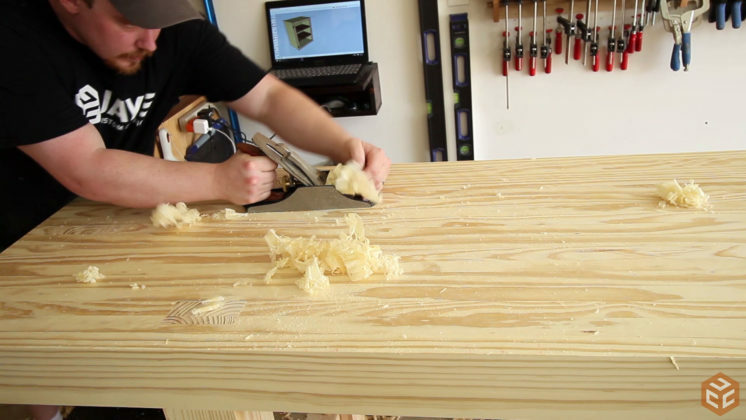 After a month or two I realized the top hadn’t moved any and decided to go ahead and flatten the top with my hand planes. I didn’t record the process at the time. 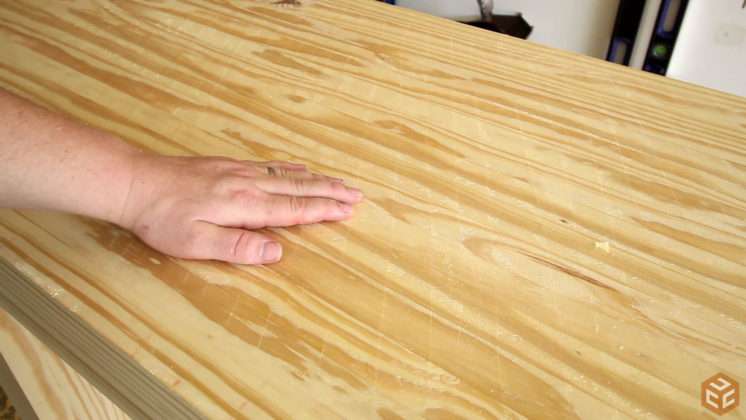 Since then several people have expressed interest into the topic of flattening a large surface with hand planes so I figured I’d look for an opportunity. 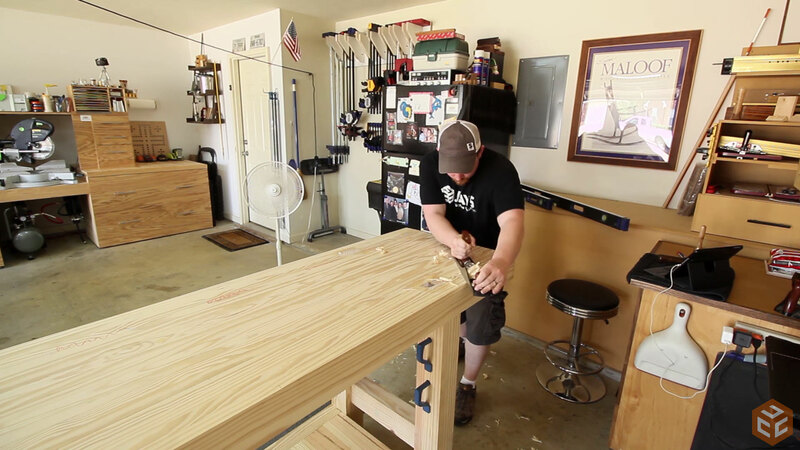 Coincidentally, my friend Wayne Brown just built a workbench using my workbench plans so I thought it would be a neat idea to go to Wayne’s shop, flatten his workbench top, and record the process while I’m at it. It’s a win win situation. We also shot a shop tour video while I was there so be sure to check that out as well if you are interested. 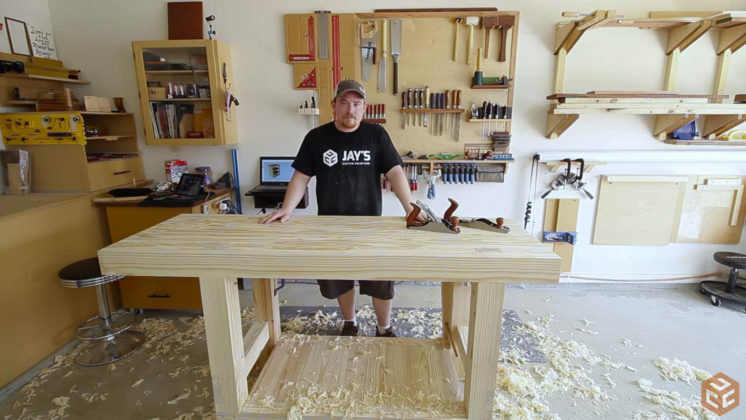 Using hand planes to flatten a workbench or a large slab isn’t difficult. It’s an exercise in hand planing fundamentals and a bit of manual labor. 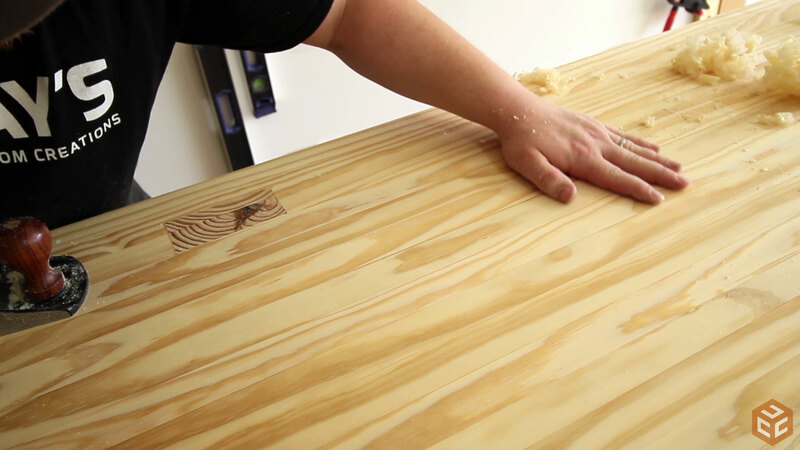 You can use a regular #4 hand plane to do the entire flattening process if you wish. 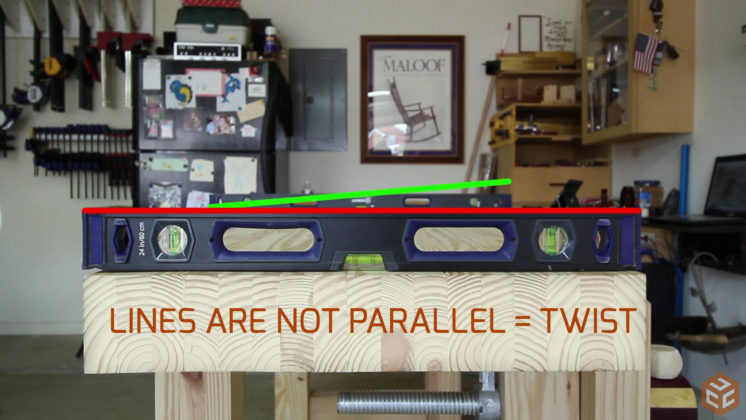 But generally speaking, the longer the plane you have the easier it will be on you for flattening wider surfaces. The longest plane I have is a low angle jack plane so I’ll use it to do all of the flattening work. 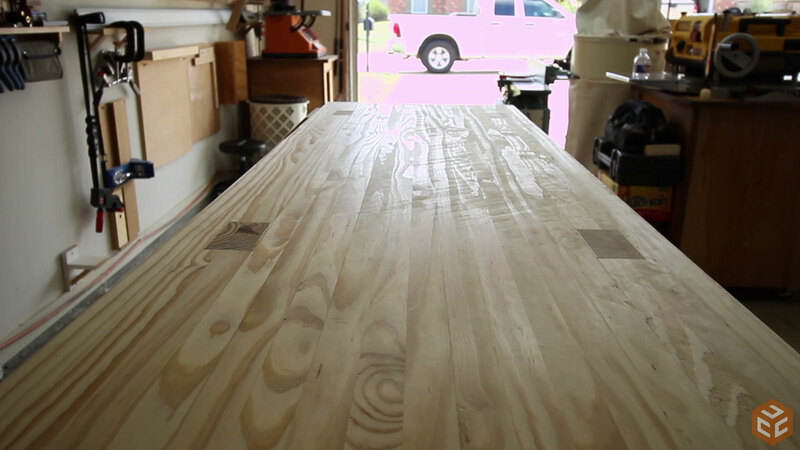 After it’s got the surface flat I’ll cover the entire workbench top once more with my #4-1/2 plane. I’ve got this plane set up to work as a smoothing plane so it will basically just remove the milling marks from the jack plane and make the top surface nice and smooth. From left to right this picture shows a Kobalt #4, WoodRiver #4-1/2, and a WoodRiver #62 Low Angle Jack. We will also need two straight edges to act as winding sticks. One of these needs to be wider than the bench top to exaggerate the twist in the bench. A crayon or pencil is helpful for identifying bad spots and also letting you know where you have and haven’t gotten with the plane. And finally some type of candle wax for the bottom of the planes. Adding wax to the bottom of the plane really makes a huge difference. I like to start by using the straight edge and the crayon to identify and mark the high spots. It’s easier to address the high spots first before getting into planing the entire bench top. Next I checked to see if there was any twist in the bench top with the winding sticks (levels in this case). 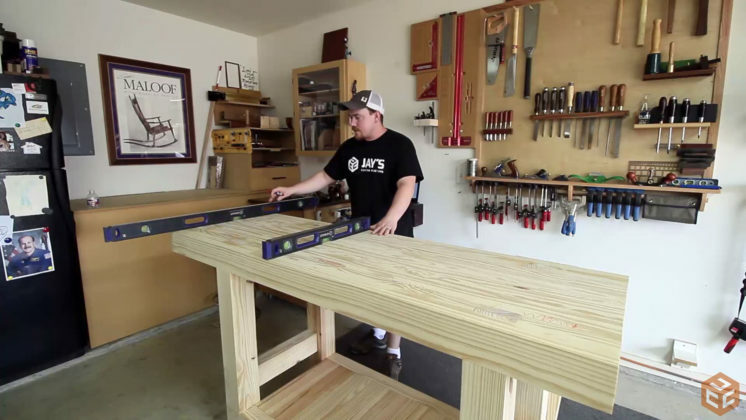 This is done by placing the long straight edge at the opposite side of the bench and the shorter one closest to me. Now I can sight down the length of the bench and see if the top of the winding sticks are parallel. If they are than there is no twist. If the sticks are not parallel and you can visually see that one of them is leaning you will know that the bench top has a slight twist that needs to be removed. It was really difficult to pick up the error through the camera lens but this top was indeed twisted slightly. Basically, the back right corner was higher than the rest of the bench. You can further identify what corner has the problem by using the winding sticks with half of the bench at a time and comparing the results. With the jack plane set fairly aggressively I started removing the high corner checking my progress with the winding sticks as I went. Getting it 100% perfect at this stage isn’t entirely practical as we still have to remove the other high spots and keep checking progress. After the high corner was situated I turned my attention to the known high spots on the bench. Knocking these down before the entire surface is worked will save some unnecessary long strokes with the plane. Once the twist has been addressed and the noticeably high spots are knocked down a bit the actually full top flattening process is started. 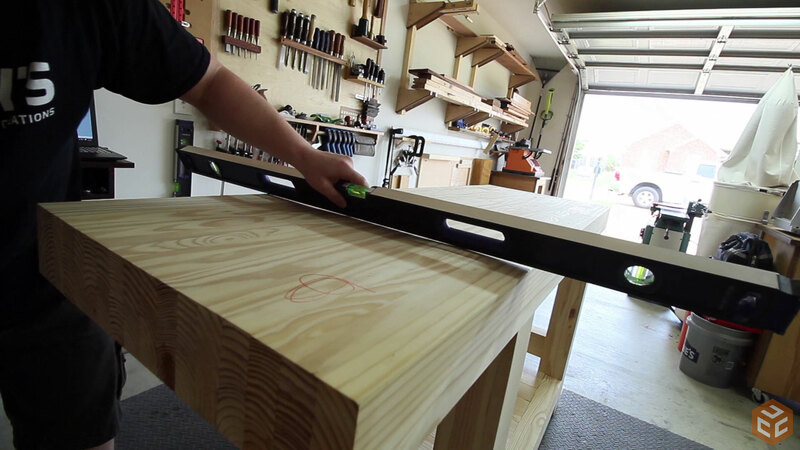 It’s important to cover the entire workbench top from left to right (or vice versa) and take full length strokes at a roughly 45 degree angle to the direction of the grain. Once you complete an entire pass of the workbench rotate the plane 45 degrees in the other direction and work your way back across the entire surface again. When you alternate directions at 45 degrees you are essentially planing at 90 degrees from your last direction. This is important as it keeps everything in check and prevents you from removing too much material or not enough material at isolated locations. This back and forth process may take a few times. I think we ended up having close to a dozen or so full passes to get the top flat with no low spots. 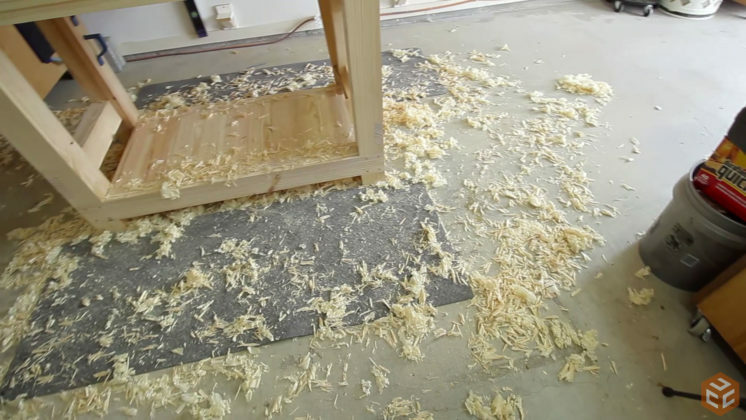 You’ll know when you get the top flat as the plane will start taking full length shavings across the entire bench as you progress. 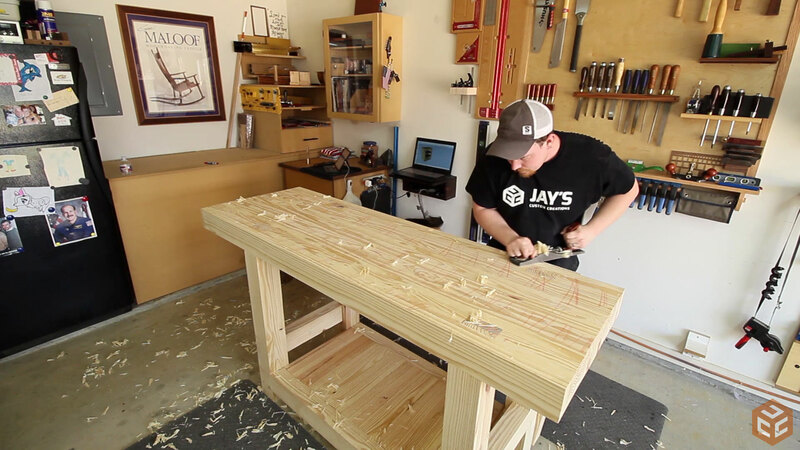 My objective was to be aggressive with the jack plane and get the majority of the work done with it. 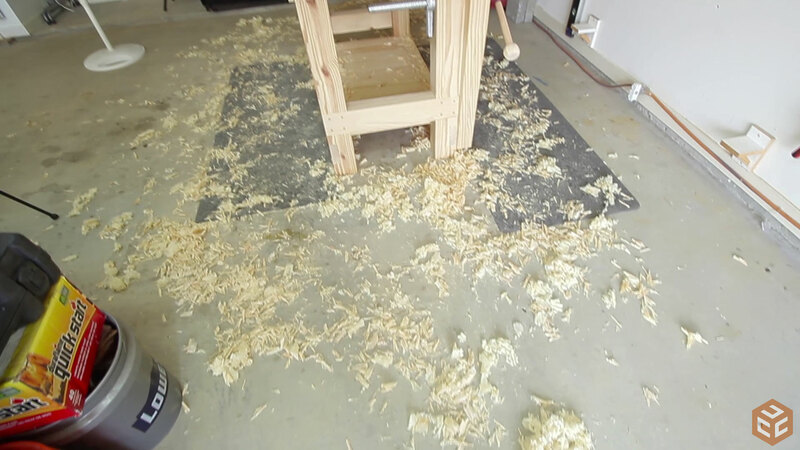 I also knew that being aggressive with the jack plane would leave mill marks in the surface of the bench. At this point the bench is flat but there are a lot of marks from the corners of the plane iron that need to be removed. Removing the mill marks can be done with any plane set to take super thin shavings. I already had a #4-1/2 plane setup as a smoothing plane so that’s the route I went. This plane was set to take really thin shavings so my only objective is to remove the mill marks, not change the thickness of the top. Here you can see the right side still has the mill marks from the jack plane and the left side had already been addressed with the smoothing plane. Again, the only objective of the smoothing plane is to remove the mill marks with super thin shavings. For the smoothing process I did go in the direction of the grain. It’s OK in this situation because I’m not removing much material at all and I’m also going in somewhat of a grid pattern to make sure I remove a uniform amount of material across the bench. It is easier to be consistent with the grain when you are setup to remove a tiny bit. Not so easy to be consistent when you need to remove a lot of material to do the actual flattening. Also, if you get tired of pushing turn the plane around and try pulling. It’s actually a lot easier on you. The resulting surface should be clear of any mill marks and nice and smooth. And of course you will probably make a huge mess during the process. Just to touch on the topic again, you don’t need a full set of expensive planes to flatten a large surface. You can honestly do it with just a regular #4 plane. It will just take a bit longer. 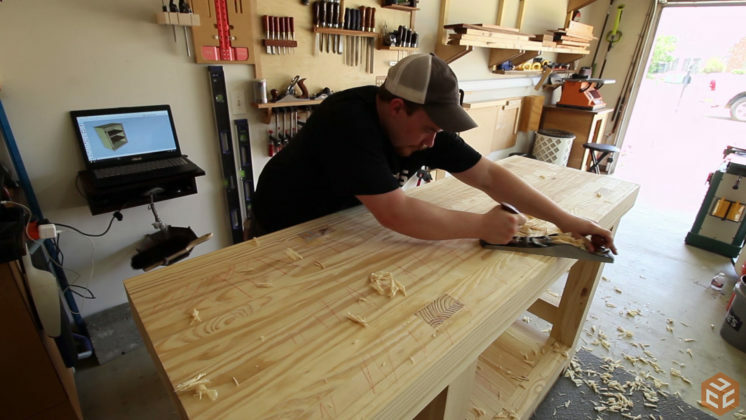 If you have been interested in giving flattening a try with hand planes or maybe you thought the process is a little intimidating I encourage you to give it a try if you have the opportunity to do so. 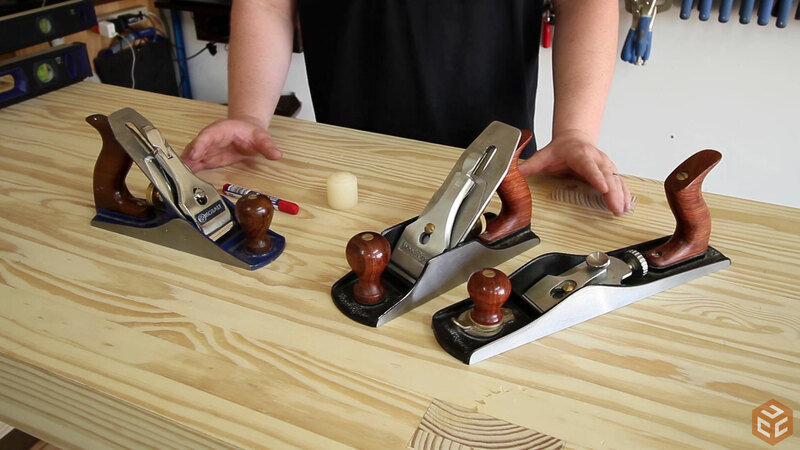 Most hand plane techniques and learning how wood reacts to hand planes is learned through first hand experience. 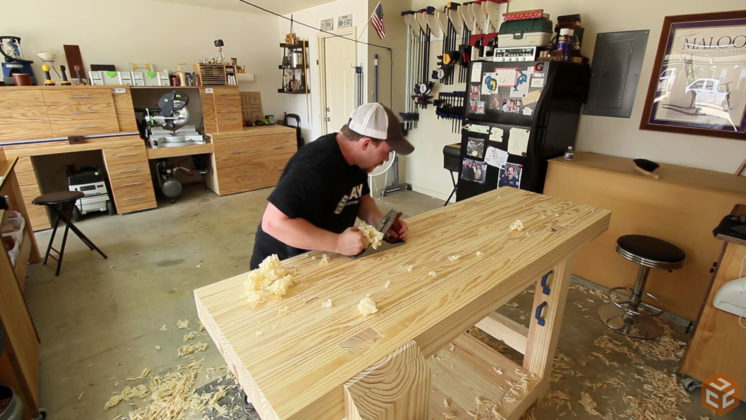 I’ve learned a lot from watching Paul Sellers and similar channels on YouTube but the majority of what I know has come from actually making shavings and analyzing the process and results. Regardless of what you do, just have fun. 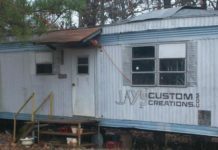 Also, if you’re interested in seeing the rest of Wayne’s shop be sure to check out the shop tour video I put together while I was there. I’m ready to watch someone flatten my bench top now. I like Tom’s reply too… time to watch someone else come flatten my bench ! 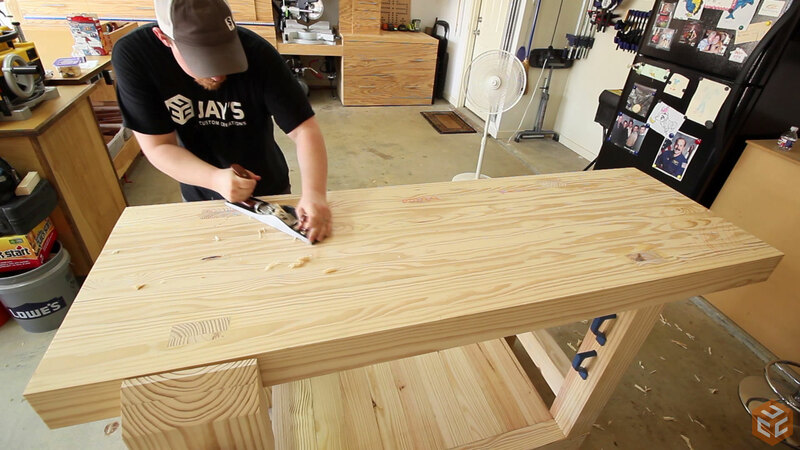 The type of finish to put on a bench is subjective. I’ve used boiled linseed oil and a few months later put a coat of danish oil on. I prefer the danish oil. It provides a little bit better protection without getting to a thick film finish like polyurethane. Some people say to use no finish at all and use a tough sandpaper to scuff it up as your material won’t slide around that way. I’ve never had any problems with my material sliding around with the danish oil. Excellent video Jay! Nice job with the visuals to help explain wind and the use of winding sticks. Your directions on the process were dead on and yet simple enough anyone should be able to follow them, and the tip about the wax is a great one for any use of planes. With your permission, I would like to send some of my Lee Valley customers and some of my joinery students to this one as a brief intro tutorial to the use of basic bench planes. 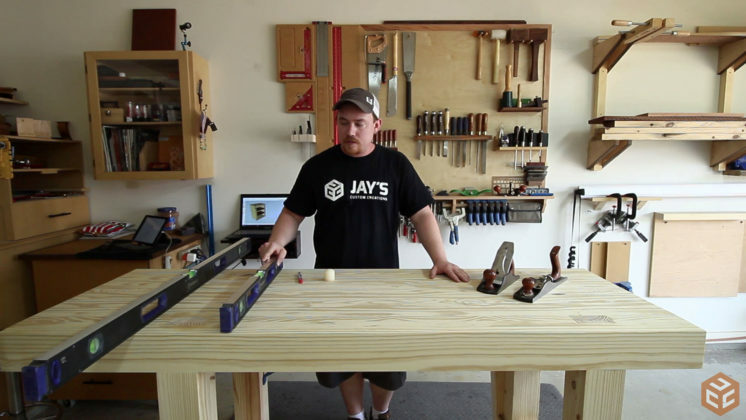 Great Job Jay, how many times did you sharpen those blades? Thanks Mike. They were sharpened before I started and because this was a fresh surface with no grime or grit from use we actually completed the entire process without the need to sharpen. I don’t belive there is a “natural” way to plane. Maybe not a traditional method but to each his own. 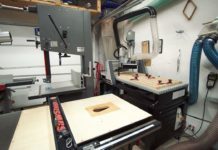 http://www.theenglishwoodworker.com/ check out this guy a hand tool professional would built work benches for a living . That is a lot of work. I used my router on mine. Set up two parallel runners and a sled. Made short work of my 7 foot bench. And no guess work. Once you get the runners set. You find the lowest spot on the bench, set the router bit to that height and go to town. But to add, I think you did a great job of explaining things. And hand tooling is always relaxing. Correct. A router setup is a lot less work. 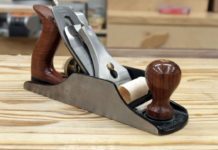 But I wanted to demonstrate the use of hand planes as not everyone has a router or want’s to go through the router plane setup. Nice job Jay…If onlyI had known, you could have nipped down here and used my bench for your video!